1950s western starring Alan Ladd and Olivia de Havilland. 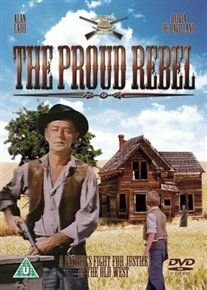 After the horrors of the American Civil War, John Chandler (Ladd)'s son David (David Ladd) has become a mute. Hoping to cure him of his ailment, John travels north in search of medical advice but on the way he is imprisoned for a crime he didn't commit. Linnett Moore (Havilland), a woman who saw what really happened during the incident, pays the necessary fee to get John out of jail. John and his son then go to live on Linnett's farm, where John works to repay her. However, they soon find themselves at the hands of the powerful Burleigh family, who are determined to take Linnett's land from her.